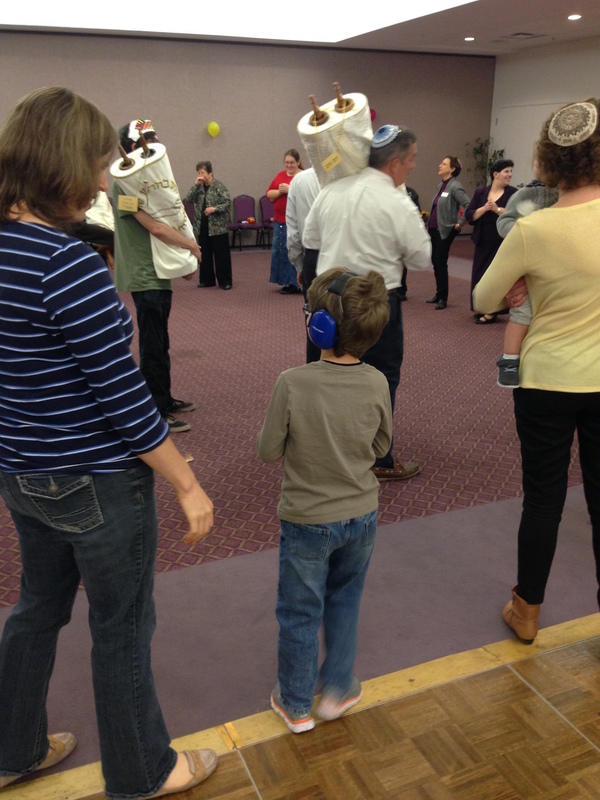 But part of the goal is also getting him more comfortable with coming to the building and being around celebrations, and… well, Simchat Torah is one of the easier times for him to be involved. The fun holidays are always easier, in the sense that he can blend in more easily without us keeping an eye towards having to rush to the quiet room if he gets fussy. No one really cares if he’s talking a bit during the goings-on, or if he’s taken his iPad into the pews with him, since there’s enough noise to cover up anything that he’s doing. On the flip-side, these are also the holidays where he’s more easily given sensory-overload, and the evening services can run late relative to his bedtime which does tend to set him off, so it’s a bit of a mixed bag. But this year at Simchat Torah, it went alright. (Setting aside the part where I got side-tracked talking to another parent whose child is in the Monster’s Hebrew class, and left both kids with the wife, which is not conducive to having a happy home.) He seemed to be content enough to march around with a plush Torah scroll and follow the parade of the scrolls we’d taken out of the ark, and even participated in a little bit of the dancing with the smallest of pushes from the wife. He was good and quiet and semi-attentive (emphasis on semi) during the Torah reading… and managed to keep it together until we were on our way home. As he’s getting still older, we’re going to have to start bringing him more often to services, so we can work on his participation, but I’m content enough for little things like this for the moment. Glad he was able to enjoy the chag. My older boy is tough. He barely went in the circle and got annoyed when I tried to put my hands on his back. However, he, like his younger brother, enjoyed the candy.